Blur are going extra-terrestrial - and this time, it's because of another tour venue outside of their UK home, which had just been announced hot off the press. 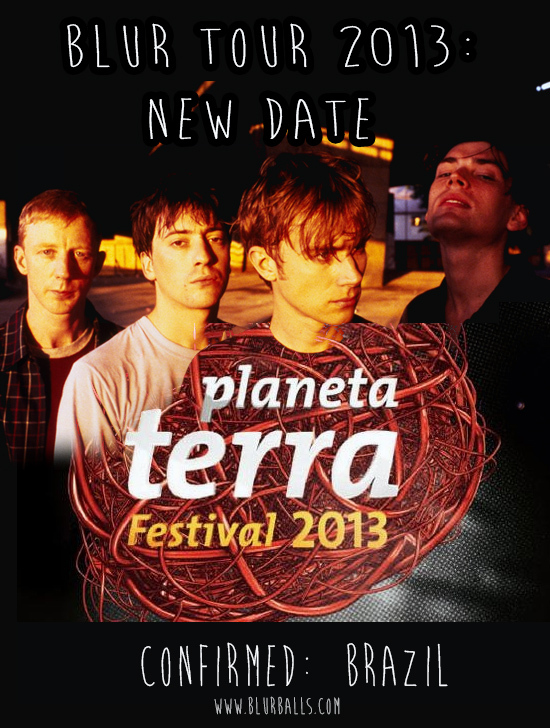 Blur are confirmed to be going to Brazil as part of their giant 2013 World Tour (view all the full dates) and are officially going to headline the Festival Planeta Terra 2013. 'Planeta Terra' means Earth in Portugese, hence the festival's nickname "Earth Festival". The festival will be held in Arena Anhembi in November 20th 2013. According to the Brazilian newspaper "Destak", the only band confirmed for the festival is Blur. The complete lineup and details of the Festival Planeta Terra 2013 have not been released. Last year, featured bands include Kings of Leon, Garbage and Gossip. Fans of Blur have already begun to spread the word through social media networks. "I will definitely buy tickets to the Festival Planeta Terra 2013 . Blur is the best rock band in England in recent times" said one Brazilian devotee on Facebook. Tickets for Planeta Terra 2013 will be available online shortly. Visit their official website and Facebook page for more information. Stay tuned for more of the latest information about Blur's new world tour, and the possible new tour dates coming up. Habrá fechas en Argentina y Chile? Después de unos meses agitados en materia de festivales, donde cerraron el Vive Latino y el Coachella, Blur confirmó ahora su presencia en el festival Planeta Terra de Brasil (que se hará a principios de noviembre en San Pablo) y los rumores de una gira sudamericana completa cobran más fuerza. La expectativa es enorme dado que la última vez que la banda pisó el continente fue en el año ‘97, en pleno furor del disco “Blur”, con hitazos como “Song 2” y “Beetlebum”. ¿Habrá fechas en Argentina y Chile? A cruzar los dedos.